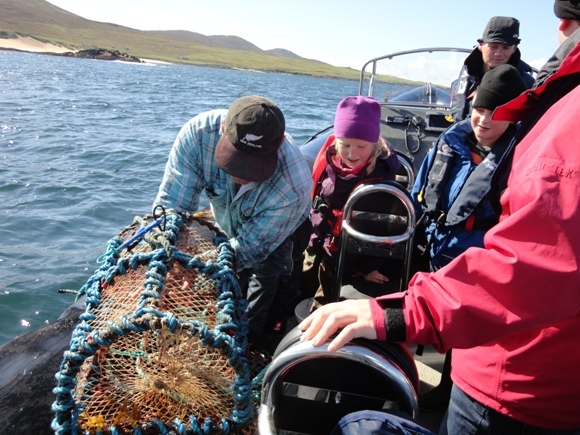 A lobster-pot is a simple framework which, as you can see, is covered with a strong net. On one side of the pot is a small hole shaped like a funnel and the bait is placed inside the pot – usually a dead mackerel. 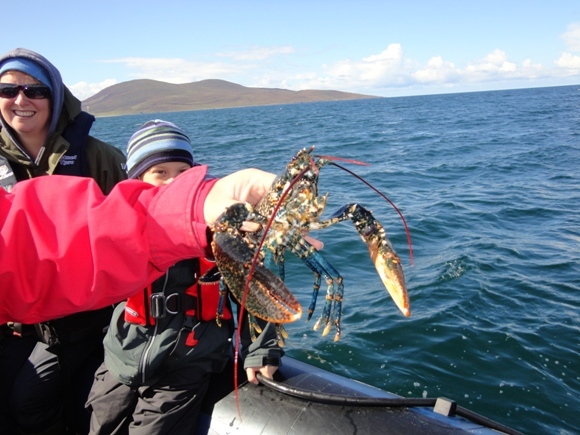 The lobster first smells the mackerel, then sees it inside the pot and finally does everything it can to get inside. Eventually it finds the funnel leading to the tasty bit of mackerel and climbs down the funnel, but once inside it’s impossible for the lobster to enter the narrow end of the funnel and get out again. It’s trapped by its own desire. As I looked at these lobster pots the Lord was showing me how sin operates in our lives. We are tempted by something sinful that we would like to have or to do. We make a choice to go after it and look for a way of getting what we want – preferably without anyone else knowing. We enter the ‘sin-pot’ by something equivalent to the funnel on the side of the lobster-pot and enjoy the ‘sin’ (the mackerel). But then we realise that the choice we made has trapped us into the consequences of that choice – we are caught in the pot! This is the essence of sin – choosing to do what we know to be wrong and finding a way of doing it. No matter how much inherited sinfulness we may have, we cannot ever blame anyone else for the sins we commit, they are always a consequence of the choices we make. But how can we ever make the right choices knowing that the enemy will constantly use the carnal nature to tempt and test us? Praise God, there is an answer! For, not only have we inherited a carnal nature, because our very life comes from God himself we have also inherited what Ecclesiastes describes as “eternity in our hearts” (Ecclesiastes 3:11). This operates in our conscience like a plumb-line of truth giving us the opportunity to know what is right and wrong and respond accordingly. Instinctively, therefore, we have a choice – whether or not to respond to the desires of the carnal nature or to choose to look at our desires against God’s plumb-line. We can then decide what we’re going to do – go ahead anyway and sin, or reject anything that’s out of line with His truth. Why would anyone ever want to reject such love? Perhaps it’s because the god of this world has blinded their eyes to the reality of what happens to those who are trapped in prison by their inherited sinfulness and have then been caught in the enemy’s ‘sin-pot’ – as a result they never discover the remedy for sin and the only way of escape. And perhaps it’s because there is now so little teaching of what the Bible says about judgement and hell, that so much of the church has lost the desire to evangelise. After all, why would we need to bother telling people about the Saviour, if we have no understanding of what it means to be ‘lost’? 5 Responses to Sinfulness is a Condition – but Sin is a Choice! Excellent, visual. Was just wondering how all those people were fed by that one Lobster? That’s easy! There were four in the pots!! Great to hear from you Derek. What a wonderful metaphor for how sin catches us. I like all others was deeply caught in the sin-pot. But like the song said, mercy there was for me and I was delivered. So much sin is psychologized and politically correct that few really realize their lostness. Thanks so much for these posts, they speak deeply to my heart.